One of the great pleasures of traveling, for us at least, is eating. I feel sorry for timid eaters who seek out McDonald’s as they roam, because food is a great adventure. We explore through food. We’ve discovered clotted cream on scones in the Cotswolds of England, dry-rub barbecue in Texas, shrimp & grits in South Carolina, fresh soft tacos in Mexico, green-lipped mussels in Newfoundland, and many other tasty wonders. Human brains have a strange affinity for remembering foods (whether we like them or not). One whiff of a unique dish can instantly bring you back to the place you first tasted it, and that stirs up the rest of your memories. Moreover, Eleanor has a strangely photographic memory for food, and an unusual talent that comes from decades of serious attention to the art of cooking: she can dissect a meal just by tasting it, revealing every spice and ingredient for later re-creation at home. Sometimes in the dark winter months when not much is happening, Eleanor will bring back an old favorite that we found during travel, and eating it will be almost as good as the original trip. My memory is poorer but a photo or two will help, so when we go somewhere I bring my camera and an appetite. On our recent trip to China, South Korea, and Japan it was a quest to eat whatever came our way, in the hopes of building a few more culinary memories, and we were not disappointed. Each country yielded a wonderful surprise. In China on the day we hiked the Mutianyu section of Great Wall north of Beijing, our guide “Sonia” took us to a local place where a five-course meal was laid out for us: Kung Pao, scallion pancakes, fried rice, a savory eggplant dish with sweet brown sauce, green beans with spices, and potatoes. Sonia put everything on one of those rotating platters in the center of our table and we all ate family-style. 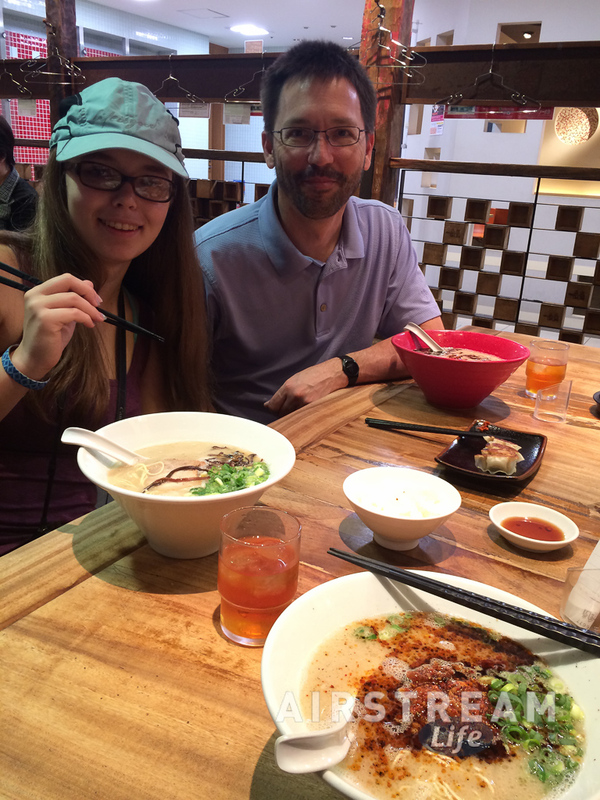 Most of it was familiar to us from eating in Chinese restaurants in the US, but not everything. I was well into the spicy hot green beans when I noticed that my tongue was going numb. About that time Eleanor asked Sonia, “Do you eat the spice seeds in this?” Sonia said no, and added that if we did eat them our tongues would go numb. A bit late for me, but we all picked around that spice thereafter. Even then we got a little tingle like licking a 9-volt battery. Eleanor asked for the name of the spice, and Sonia pulled up a translation on her phone. It came up as “Szechuan peppercorn,” and looks like a gray version of the black peppercorns we use in the US. The restaurant was just a minimally decorated room with an open door, but through the windows we could see the Great Wall snaking its way along the ridgeline of the foothills. 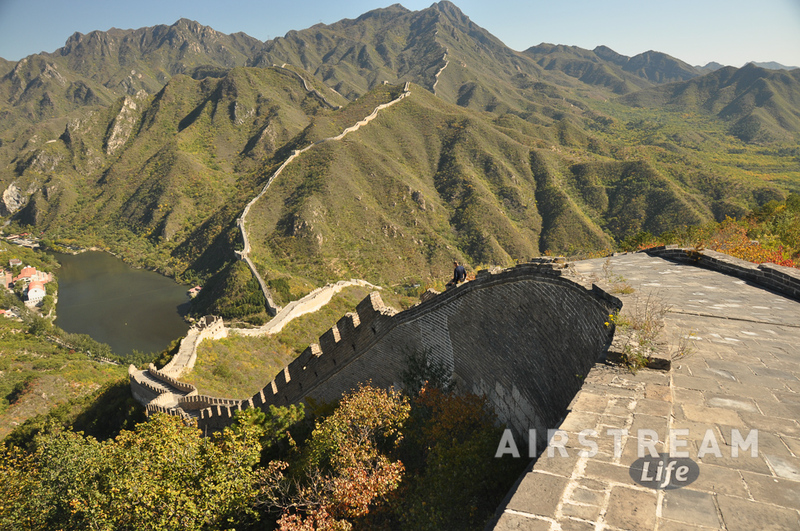 And as we ate we knew we’d just hiked that amazing wall, virtually alone, in China. You don’t forget a meal like that. 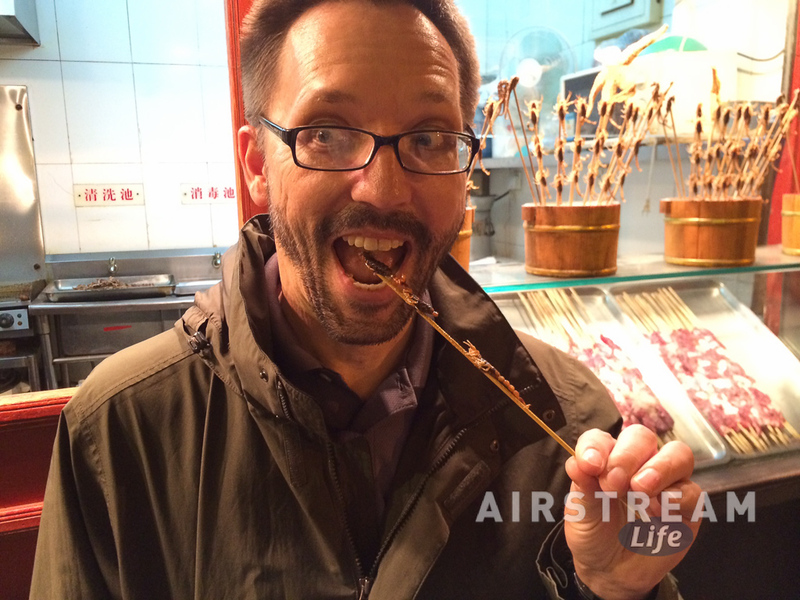 But there was a side street, or hutong (narrow alley) called the “Snack Street” that looked promising. We shoved and squeezed our way through a dense crowd to find dozens of food vendors selling all kinds of interesting things, and this became dinner. We’d pause in the slowly moving sea of humanity and point at some dumpling, crepe, candied treat, bottled yogurt, or pastry, and for a few yuan it would be ours. If it wasn’t something that had to be made in advance like the yogurt, they’d cook it to order in just a minute or two while we waited, so most of what we ate was very fresh. Most items were 10 or 15 yuan ($1.60 – $2.40) and I think the most expensive thing we bought all evening was the fried scorpions for 25 yuan. The scorpions were for me, because I’d been challenged by my barber back in Tucson to eat a scorpion on a stick. (I sent him this photo as proof.) They were quite tasty and now I wish I’d also tried the fried grasshoppers. Another favorite was a huge sort of scallion pancake with egg that Eleanor ordered and we all shared. My favorite thing was a whole fish on a stick, about 10 inches long, fried and sprinkled with spices. Absolutely delicious, but it took a while to work around the little bones. You don’t forget a meal like that quickly, either. 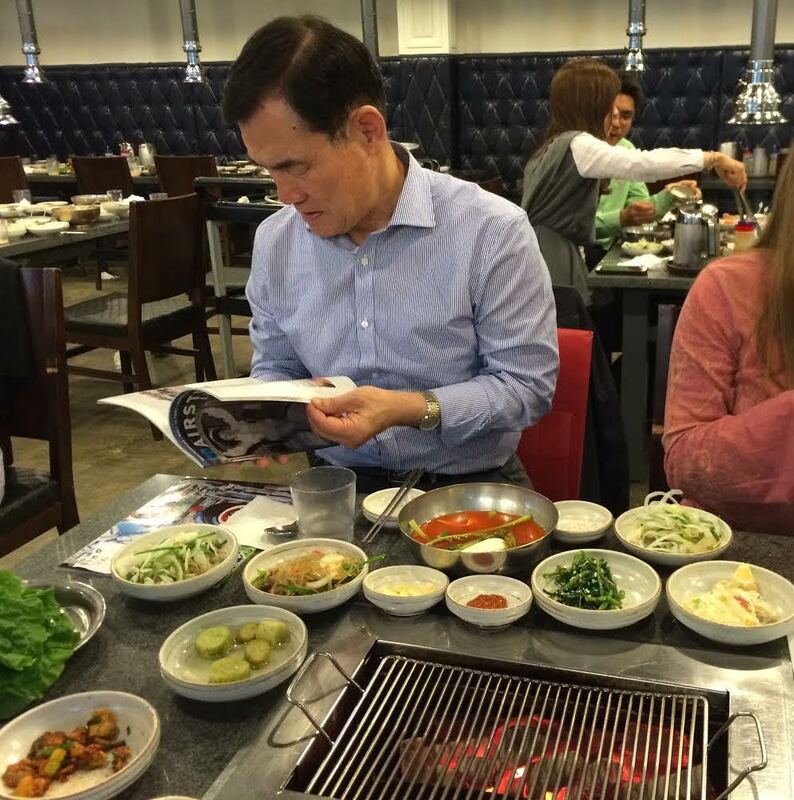 In Seoul, South Korea, our host Sungsoo took us for Korean barbecue. You can get something like that in the US, but it’s really great the way they do it in Korea. The meal starts with the waiter bringing over some damp towels and a huge array of small dishes. Our table was covered with kimchee with octopus, seaweed salad, green salad, marinated onion salad, hot bean paste, cellophane noodles, and some green vegetables in a red broth. Sungsoo ordered two kinds of beef for the barbecue, plain and marinated. After the table is packed to the very edges with all the side dishes, the waiter brings over a steel bin with hot coals, which are dumped into the stove at the center of the table. A small hood hanging from the ceiling collects the smoke. The waiter brings over the beef, which is sliced thin, and cuts it up into bite-sized pieces with kitchen scissors. These go on the fire, and the waiter returns periodically to turn them over and cut more beef. As patron, your only job at first is to eat the beef and side dishes in any combination you like, perhaps smearing a little hot bean paste on the beef and rolling it in a lettuce leaf. The waiter returns less frequently as you get the hang of grilling the beef yourself, but the side dishes get replaced whenever you ask for more. Sungsoo felt we should have the full experience, so after we’d cleared most of the table he ordered cold noodles in broth with rice vinegar and hot mustard. The broth was so cold it had chunks of ice in it, another thing we’d never experienced. It reminded me of eating maple sugar on snow as a kid. It was all wonderful. We liked the Korean barbecue so much that we had it again the next day on our own. Thanks to Sungsoo’s lesson the day before, we were able to navigate the process by ourselves, even though each restaurant does it a little differently and our resident Korean translator (Emma) only knows the words that she needed to learn for karate class. This made the second meal nearly as memorable as the first. Finally, in Japan we had one meal that really stood out over all the others in Japan. It’s an expensive country, and it was a daily struggle to find restaurants that wouldn’t blow the budget. On our final day in Yokohama we discovered a noodle place that was buried in the lower level of a shopping center. I loved this place. We were seated at a large rectangular table with eight other diners, all Japanese. In front of us were containers with chopsticks, kimchi, pickled ginger, sauces, and a large jug of cold tea. We each picked out a noodle bowl and we ordered sides of rice and dumplings to share. It was fantastic. I wish I could go back. The noodle bowls came topped with a melange of floating spices like nothing I’ve ever had before. The iced tea had a certain astringency and flavor that was the perfect complement to the spicy broth in our bowls. The dumplings were perfect: not greasy or bland, but lively and fresh. I peeked over at the other diners at our table to get some hints about the proper slurping etiquette, and then we dug in with our chopsticks. While we ate, a huge line began to form outside. Apparently we had found the good place to get lunch, and arrived just in time. The bill was about $26 for all three of us. Considering prices in Japan I would have considered it a bargain at twice the price. So you see what I mean. There was a KFC and Starbucks on every corner in China, but any meal we had there would have been a non-event. We were traveling to find something different and exciting. Choosing to push your own boundaries in any way is a path to growth (even if you hate the result, you’ve learned something). Expanding your food resumé is one of the most rewarding and memorable ways you can do it. How does this relate to Airstream? Well, one of the great things about traveling by RV is that you can prepare your own meals. But sometimes it’s also the worst thing, because it is so seductive to cozy up inside and miss out on the fresh experiences outside your door. Once in a while, it’s important to get out of the comfortable bubble that your motorhome or travel trailer allows, and have a taste of something else. I predict the successes will far outweigh the disappointments. Love it, Rich! Glad you guys had such an interesting trip! I couldn’t agree more Rich. There is no better way to learn how diverse this planet is than to discover what they eat locally. That is particularly true in Asia. I feel sorry for the people who spend all that money to go to China and eat American fast food. Thank you for sharing.